Microsoft provides a powerful scaffolding engine for models in ASP.NET MVC applications that use Entity Framework. Scaffolding relieves web developers from the mundane task of writing the create, read, update, and delete (CRUD) code over and over again. The scaffolding engine uses T4 templates to generate basic controllers and views for models. However, scaffolded code is just a starting point, since it often needs to be customized to meet specific business requirements or satisfy specific design patterns. 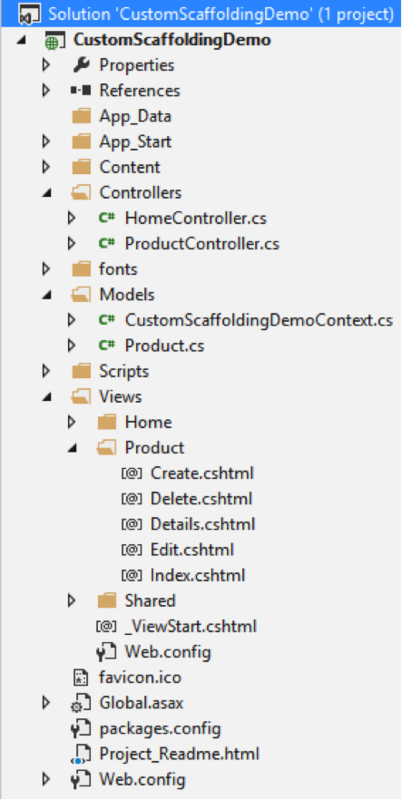 In this blog post, I’ll provide a walkthrough on how to create project-specific custom scaffold templates for ASP.NET MVC. This can be a huge time-saver in applications with a large number of controllers and views. I will use Visual Studio 2013, ASP.NET MVC 5, Entity Framework 6, and C#. To get started, create a new ASP.NET MVC web application and add a simple Product model with the properties shown below and build the project. First, let’s use default templates to scaffold a controller and CRUD views for the Product model so we can review the results. To do so, right-click the Controllers folder in Solution Explorer and click Add New Scaffolded Item. 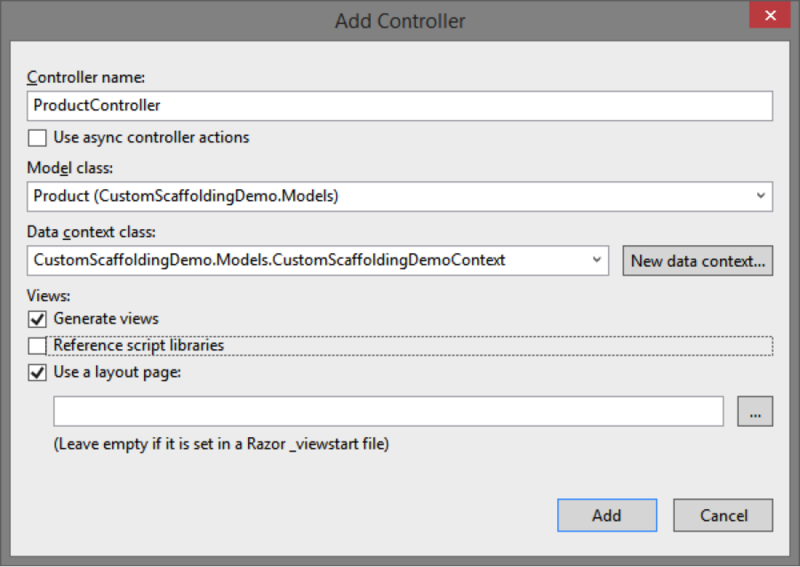 In the Add Scaffold dialog, choose the MVC 5 Controller with views, using Entity Framework. On the Add Controller dialog, create a new data context and choose appropriate options that serve as parameters for the scaffolding engine. Then hit the Add button. The scaffolding engine will use the default T4 templates to generate code for the controller and five views and add them to the appropriate folders. At this point you have full CRUD functionality for the Product model and can run the application. – Created Date and Updated Date properties should be set automatically by the system on create or update action respectively, and thus should not be editable on the Create and Edit views. – Products should be soft-deleted, so the Delete action of the Product controller must be changed to set the IsDeleted property and updating the Product instead of deleting it from the database. Index action should only return Products with IsDeleted set to false. – None of the views should display the IsDeleted property. – Views should use @ViewBag.Title as the page header instead of the view name. – You may be using a Unit of Work pattern, so all calls to save changes to the database may need to be tweaked. – Typically, you would want most, if not all, controllers and views to be consistent across all models in your application. Making similar manual changes to controllers and views for all models is not an efficient approach. – When you make changes to a model, you will either have to scaffold these files again and lose your manual changes or manually update all views to match the updated model. The best way to avoid manual changes and enforce consistency is to customize the scaffold templates. The original T4 templates used by the scaffolding engine are located in this folder: %programfiles%\Microsoft Visual Studio 12.0\Common7\IDE\Extensions\Microsoft\Web\Mvc\Scaffolding\Templates. While you can directly edit these templates, this will affect scaffolding for all future projects, which is not recommended. Instead, you can create project-specific copies of these templates so you can customize them. 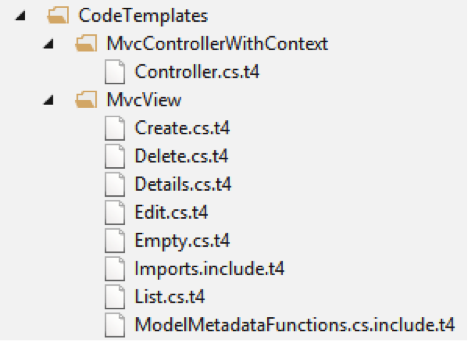 To do so, copy these templates into your MVC project’s CodeTemplates folder, following the same sub-folder structure. You only need to copy either C# or VB.NET templates, based on your project. The template filenames include the language they use. The convention is that the scaffolding engine uses the templates in the CodeTemplates project folder, if one exists, instead of the global templates. Now you can modify these custom scaffold templates, which would affect scaffolded code only for this project. T4 templates are simply text files and can be edited directly in Visual Studio. Unfortunately, Visual Studio 2013 does not include a good T4 editor—there’s no syntax highlighting or IntelliSense. Fortunately, there are some third party add-on products that provide this functionality. Below is a screenshot of how the templates look in Visual Studio 2013. You can see I modified the header on line 26 to use @ViewBag.Title instead of the view name. // markup for a partial view, a view using a layout page, or a regular view. To learn more about scaffolding check out this walkthrough from Microsoft. To learn more about T4 templates in general, start by reading this MSDN article. In this short tutorial, I will show how to use AngularJS in ASP.NET MVC. I hope that you enjoy this short tutorial and this is helpful. While asset bundling is a great feature of ASP.Net, it is easy to get carried away. When I came on there were a lot of projects that just included all the js files for the entire application in a single ScriptBundle. This was one of the first places I set my sights. I decided that a lot of the services would be shared, so they could go in their own Angular module and in their own ASP Bundle. Then each mini-app could get it’s own module and bundle. Lets take a look at theBundleConfiguration.cs file. As an ASP.Net MVC developer, you are probably used to letting the routing engine create urls for you when you need them. And why not? Who knows what crazy routing constraints the client/pm/other developers decided needed to be in your application. And with Razor helpers, this is pretty easy. Angular shouldn’t have to try hard to figure out those rules. So how do we combine these two worlds? In the manage app we are going to need some data. When the situation calls for it, I don’t mind sending that data down with the app. I think I took this idea from John Papa or one of those PluralSight authors. Basically, I just use JSON.Net to serialize my dataset on the page. Let’s take a look at it.